Bleeding gums are a common sign of gum disease, one of the leading dental health concerns facing adults. The American Dental Association estimates that as many as 75% of American adults have some form of gum disease. When treated early, gum disease is easy to cure. 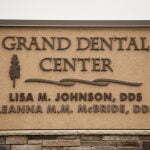 Routine visits to Grand Dental Center for screening and professional teeth cleaning can help you intercept problems in the early stage and avoid complicated treatment. Many people believe bleeding gums is a sign of good brushing. However, it is not normal for gums to bleed when you brush. Bleeding gums are often caused by a build up of plaque along the gum line. Plaque can push down into the pockets of the gum and harden into tartar. As you brush or floss your teeth, this irritates the sensitive gum tissue and can cause bleeding or soreness. Brushing too vigorously can cause gums to become irritated and bleed. We recommend using a soft bristled toothbrush and your dental hygienist will demonstrate proper brushing techniques at your next preventive care visit. Bleeding gums are also common during pregnancy because of hormonal changes taking place in the body. Pregnant women should continue to brush and floss, but be extra cautious around sensitive gum tissue to prevent bleeding. It is important to maintain routine visits to the dentist during pregnancy to monitor gum health. Routine Dental Cleaning – Prevention is the best way to fight gum disease. You can maintain healthy gums and ward off gum disease with regular visits to the dentist for professional teeth cleaning and examination. Dental cleanings are performed by a dental hygienist who gently and skillfully removes plaque and tartar from between the teeth and around the gum line. Antibacterial Mouth Rinse – In some cases, your dentist may recommend an antibacterial mouth rinse to reduce harmful bacteria in the mouth and control infection. Scaling and Root Planing – This is a technique used to remove plaque and tartar from deep pockets in the gum and smooth the surface of tooth roots. Periodontal Therapy – Periodontal therapy may include scaling and root planing as well as other procedures to remove infected tissue and bring the gums back to health. If you are suffering from bleeding gums, call Grand Dental Center at 218-326-0339 today to make an appointment. We provide expert treatment of gum disease. We are known for our family-oriented office. We look forward to treating your entire family! Just had a cleaning with Mary last night. She’s fabulous! Well deserved recognition! Going to see Alyssa today!